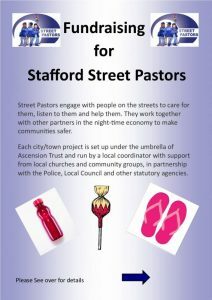 Each city/town project is set up under the umbrella of Ascension Trust and run by a local coordinator with support from local churches and community groups, in partnership with the Police, Local Council and other statutory agencies. £1.00 buys 3 Bottles of water: We spend time with those who need some water and time before making their way home. This negates the need for Police intervention. £1.00 buys 2 Sick Bags: these sick bags enable those who may otherwise be refused travel home by taxi, to do so. This safeguards the vulnerable from having to walk home, sometimes alone. £1.00 buys 5 lollies which diffuse aggressive situations and are a provision of sugar when needed! Street Pastors across the UK are recognised for saving costs that would otherwise be paid for by the NHS, the Police and the Local Authority.